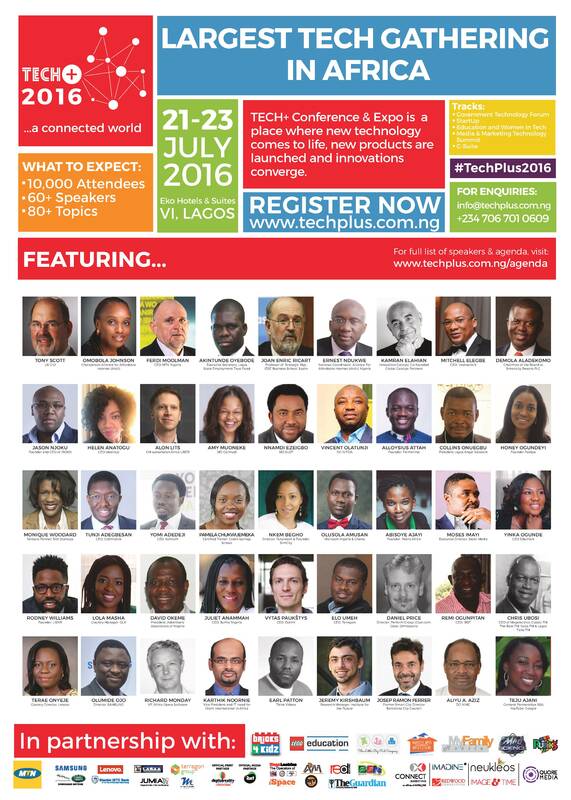 Top industry experts, resource personnel and thought leaders have been announced as speakers for the second edition of Nigeria’s largest tech event, #TechPlus2016, billed to hold from 22nd – 23rd July 2016 at the EKO Hotels Conference Centre, V/Island, Lagos – Nigeria. 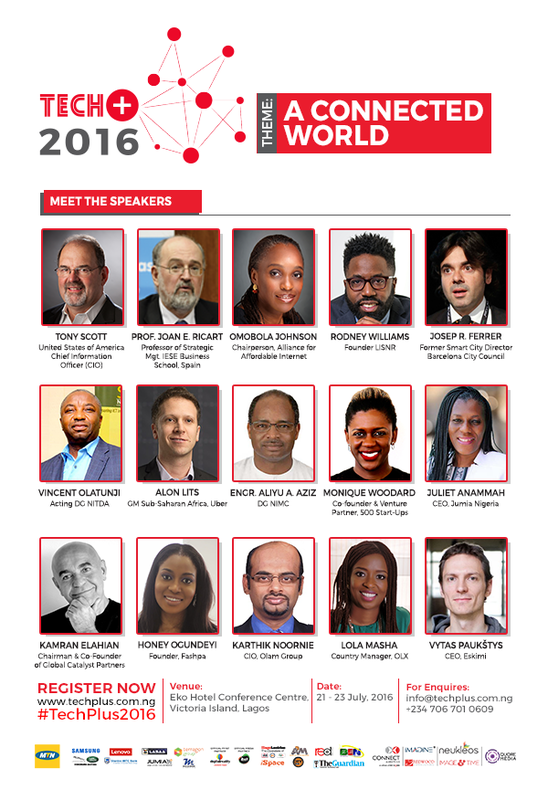 Speakers include Mobola Johnson, Chairperson, Alliance for Affordable Internet; Juliet Anammah, CEO Jumia, Nigeria; Alon Lits, GM Sub-Saharan Africa, Uber; Helen Anatogu CEO, Idea Hub; Monique Woodard, Co-Founder and Venture partner, 500 start-ups; Lola Masha, OLX; Engr. Aliyu A. Aziz, DG NIMC; Folabi Esan, Director, Adlevo. Others are: Professor Joan Enric Ricart, Professor of Economics and Strategic Management and Head of IESE’s Strategic Management Department; Vincent Olatunji Acting, DG NITDA; Josep Ramon Ferrer, Former Smart City Director & Deputy CIO (Barcelona City Council); Tope Ogunfayo, Supply Chain P&G; Rodney Williams Founder, LISNR; Karthik Noornie, Olam Group; Vytas Paukštys, CEO, Eskimi; Kamran Elahian, Chairman & Co-Founder of Global Catalyst Partners. Unveiling the speaker line-up in Lagos, Managing Director, Connect Marketing Services, organisers of the event, Tunji Adeyinka, remarked that the quality of speakers for #TechPlus2016 is prime to give premium to conference attendees of various cadre. “Drawn from diverse sectors and unique backgrounds, the speakers’ trail reflects the dynamics of technological evolution in the 21st century with a fine blend of both local and international experiences,” Tunji said. Techplus is a gathering of everything technology, providing a robust tripartite tech experience through its conference, exhibition and gaming structures whilst serving as a platform for knowledge sharing, networking and marketplace for the consumers and businesses. You can also connect with the event on major social media platforms via @techplusng and join the conversation of ‘A Connected World’ via the official event hashtag #TechPlus2016.